Alita: Battle Angel is a labour of love for writer-producer James Cameron, who from as early as 2000 had been interested in making a film based on the popular manga series by Yukito Kishiro, and was intending to direct before being sucked into the world of Avatar; however, his passion for the project never seemed to wane, and in 2015 he hired director Robert Rodriguez to nurture the project whilst he was busy on Pandora, and nineteen years later it is finally upon us. Though Rodriguez is credited as director, you can sense Cameron’s fingerprints are all over this project, which isn’t necessarily a bad thing; the movie is about as ambitious and epic as your standard Cameron blockbuster, with world-building methods and cutting-edge visual effects that are right within the same metric as Titanic or even Avatar, and if nothing else this movie absolutely needs to be seen on the biggest screen you can find just to see how absolutely stunning it looks. So far, response to this movie seems to be mixed, and while I certainly have a few issues with the movie, I really did enjoy it a lot more than I was expecting to; who knows, I might be in a minority for liking this movie (I’ll have to wait to see more reviews pop up before garnering more of a consensus), but I can’t help it, because I really did like this movie, flaws and all. Set in the 26th century, after an event known as “The Fall” caused the world to become something of a wasteland, a disembodied cyborg is found in a scrapyard within Iron City, a grungy environment underneath the utopian sky-based city of Zalum, by kindly doctor Dyson Ido (Christoph Waltz), who takes it home and gives it a new body. The cyborg, whom Ido names Alita (Rosa Salazar) after his deceased daughter, wakes up with no memory of who she once was, but has a curiosity for the world as wide as her eyes (we’ll get to those in a bit); however, certain events begin to reveal some unexpected strengths about her, and Alita starts to learn a bit more about who she once was whilst taking on some new enemies, including several cyborg bounty hunters and menacing scientists like Ido’s former lover Dr. Chiren (Jennifer Connelly) and her boss Vector (Mahershala Ali), and also falling for local boy Hugo (Keean Johnson), who we’ll also get to in a bit. First, the good stuff; this movie is absolutely gorgeous to look at, from the stunning cinematography to the extremely realised visual effects, which are truly outstanding. Alita herself is portrayed by actress Rosa Salazar via motion capture, and the results are truly something to behold; the smallest details on her are so wonderfully realised, with even her enlarged eyes (done to draw her design closer to her original appearance in the manga) feeling extremely real, and even though you’re fully aware that she is a wholly CG character, the effects on her are so good that sometimes you’ll be questioning whether or not she really is real. Salazar brings a great humanity to the character, who you’re with from her very first moments on-screen as she’s giddily exploring her new environments and learning new skills such as the popular sport Motorball, and she does so with true ferocity and charm that will immediately win you over. The rest of the effects, from the several other cyborg characters to glimpses of the tall buildings in the background, are no less impressive, with highly creative designs and enjoyable details that make you want to explore more of this place; they also work wonders to bring visceral and exciting action to life, which is where Rodriguez channels his inner Paul Verhoeven with some surprisingly graphic violence that’s straight out of something like RoboCop or Total Recall, whether it’s something as simple as a bar fight or an incredibly tense scene where we get to see Motorball be played out in all its glory. The movie deserves to be seen on the big screen, especially on an IMAX, just to see these visuals in all their glory. However, the script more often than not tends to rely on heavy exposition to set up this universe, which can often be a little long-winded and takes the focus away from developing some of these characters, many of whom seem to drop in and out of the movie at several intervals. I can see some people getting frustrated with this aspect of the movie, not to mention how there are many things to this story that feel recycled from other movies – though not to the extent of Cameron’s Avatar; at least this movie wasn’t just Dances with Smurfs – but it didn’t entirely ruin the movie for me; I thought the movie found its footing eventually, and that was whenever it was focusing on Alita’s character as well as her romantic relationship with Hugo. This is another aspect of the film which I can see being criticised heavily, and I’d be lying if I said I didn’t understand why; it doesn’t help that these characters are given some pretty cheesy romantic lines to say to each other, but the Hugo character isn’t especially interesting and often feels more lifeless than the CG cyborg he’s acting opposite. It feels like they’re only together because the script wills them to be, because their lines are largely dedicated to either setting up this world or just declaring how much they like each other. Again, though, these flaws didn’t ruin my overall enjoyment of this film, as I felt that it was an entertaining enough experience with an incredibly likeable lead character and some absolutely stunning effects that bring her and this world to life; it’s definitely worth seeing on the biggest screen you can find, if only to get sucked in to this gorgeous world and Alita’s huge and expressive eyes. 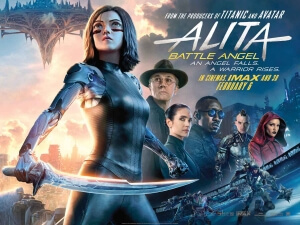 Alita: Battle Angel isn’t without its flaws, including an exposition-heavy script and cheesy romance sub-plot, but the extremely stunning visuals and the fantastic realisation of its lead CG heroine, as well as some creative designs and entertaining action, keep its head above water just enough for a solid recommendation, especially on an IMAX.